Our mission is to maintain a healthier and more productive workplace by providing complete refreshment services to businesses, schools and other private and public enterprises throughout North and Central New Jersey with responsible, custom-tailored, "green" products and options that address specific needs of our customers. 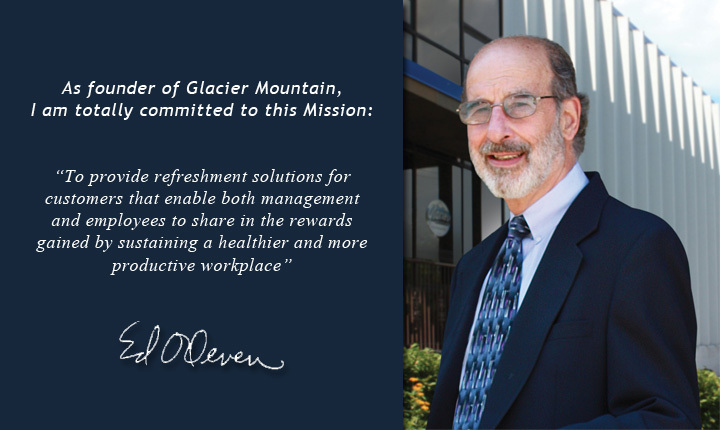 Glacier Mountain products include natural mountain spring water, filtered bottle-less drinking water systems, an office coffee service with all the conveniences of the most modern coffee brewing equipment; as well as beverages, snacks and essential break-room supplies. Ask for a no-obligation presentation and discover the many benefits already enjoyed by hundreds of Glacier Mountain customers since 1989.